THOUSAND OAKS, CA � Young Artists Ensemble presents THE LITTLE PRINCE directed by Suzanne Tobin. Performances are Fridays, Saturdays, and Sundays February 1 - 24, 2019. Young Artists Ensemble performances are February 1 � 17, 2019 and Conejo Theatre for Everyone performances are February 22 -24, 2019. The Little Prince is the beautiful and lyrical story, based on the book by Antoine de Saint-Exup�ry, about a little boy who finds magic in everyone and everything he encounters throughout the universe - from a single rose, to a wild fox, to a stranded pilot. An additional final weekend includes performance by CONEJO THEATRE FOR EVERYONE, teaming up YAE kids and performers with special needs for a unique theatrical experience. 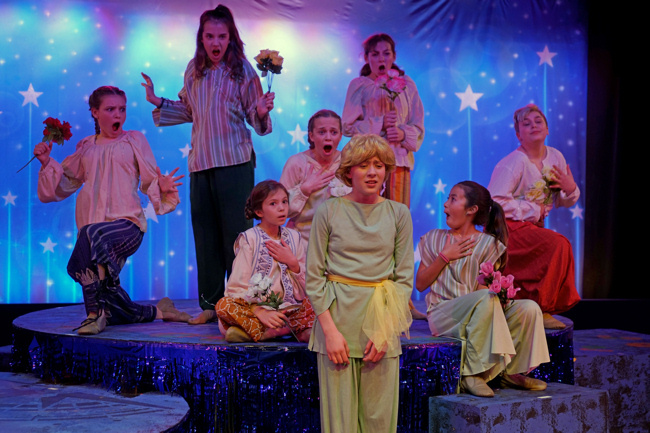 THE LITTLE PRINCE is the second production in Young Artists Ensemble�s 38th Annual Family Theatre Season. The �Season of Unexpected Magic� will conclude with DISNEY AND CAMERON MACKINTOSH�S MARY POPPINS, JR. May 3-19, 2019. Tickets can be purchased at a deep discount by contacting the box office at (805) 381-1246 or www.yaeonline.com. Young Artists Ensemble received 19 nominations and four wins for their 2017-19 Productions. Winners in the 13th Annual National Youth Arts Awards included Outstanding Production: Grease, Outstanding Lead Performance in a Musical: Nick Meyer as Danny Zuko in Grease, Outstanding Supporting Performance in a Musical:Kristen Wisneski as Marty in Grease, and Outstanding Musical Direction: Zachary Spencer for Grease. Among the many nominees were performers and creative staff from Hillcrest Players Productions Shadow of a Pout and If the Shoe Fits, and Young Artists Ensemble�s production of Madagascar, Jr.
WHAT: Magic is everywhere in Antoine de Saint-Exup�ry�s delicate and enchanting tale of mysterious little boy and his adventures through the universe. Follow the Little Prince as he journeys from his tiny planet with a single rose, through the cosmos, to ultimately share his adventures with a pilot stranded in the Sahara Desert on Earth. An additional final weekend includes performance by CONEJO THEATRE FOR EVERYONE. Single Tickets: $19 adults, $16 children, students and seniors. 10% discount for groups of ten or more for a single performance. WHAT: THE LITTLE PRINCE The Therapeutic Recreation Unit & The Young Artists Ensemble combine to present this show featuring performers with and without disabilities in a unique theatre experience. WHAT: Disney and Cameron Mackintosh�s Mary Poppins, Jr. brings a new nanny with a twinkle in her eye and medicine for anything that ails to the Banks Family. Can she help them find their way back to each other? Perhaps she can, with the help of a chimney sweep and a host of family joy. Disney and Cameron Mackintosh�s MARY POPPINS, JR. is the third and final production in Young Artists Ensemble�s 38th Annual Family Theatre Season.